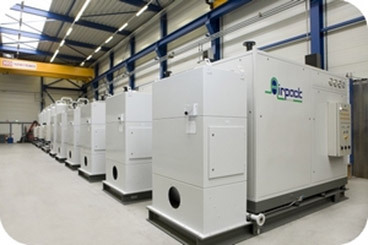 Airpack screw type compressor packages are the ultimate space saving solution. Their wide range of applicable capacities and compact design makes them perfectly suitable for space restricted applications like FPSO or offshore projects. Airpack screw type compressor packages come completely assembled and shop tested. All interconnecting piping, wiring and control systems are included. Only local hook-up is required. Airpack screw type compressor packages can be supplied in both oil lubricated and oil free models, depending on preference and/ or application.